Zecharia Sitchin was a Russian linguists and historian. An expert of the Sumerian civilization, he was one of the few scholars capable of deciphering the Cuneiform characters. Sitchin takes as certain and realistic, although confusing, all that is commonly called mythology. All that represents the customs and the traditions of people, from ancient lore to the folk tales, from figures painted inside temples or upon tools and objects, to the various rituals, ceremonial dances and chants, would be nothing but faint memories of real facts. Recent astronomical data confirm the discovery of another planet in our Solar System, a planet whose orbit is so wide that its transit between Mars and Jupiter would occur only every 3,600 years. The Sumerians were aware of the existence of a planet, which they called Nibiru or “The Planet of the Crossing”, that came from deep space, far beyond our Solar System. Its inhabitants, the Anunnaki, began to visit the Earth about 500,000 years ago, and the chronicles of those days can be found – according to Sitchin – in all our Ancient Texts such as the Bible or the Book of Gilgamesh. The Enuma Elish (“When Above”) dates back to more than 4,000 years ago; it is written in cuneiform characters and is composed of seven tablets describing the formation of our Solar System in the form of a narrative. This is how the Enuma Elish begins. Originally only three gods exist: Apsu (“One Who Exists From The Beginning”), Mummu (“One Who Was Born Of Waters”), and Tiamat (“Maiden Of Life”). 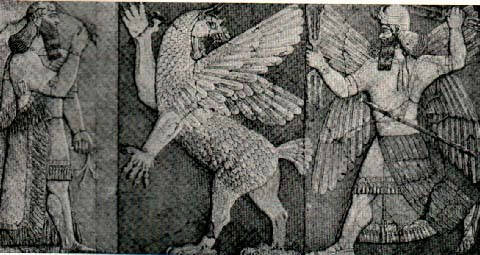 The parallel between the gods of the Mesopotamian texts and the planets of our Solar System led to the identification of Apsu with the Sun, Mummu with Mercury, Lahamu with Venus, Lahmu with Mars, Tiamat with Earth, Kishar with Jupiter, Anshar with Saturn, Gaga with Pluto, Anu with Uranus, and Ea/Enki with Neptune. The tablets continue describing the turbulent and irregular orbits of the planets, a series of chaotic occurrences that finally brought peace. That ended with the arrival of Marduk, a new god (thus a new planet, born elsewhere). A god was engendered, most able and wisest of gods. His growth was manly, he was mighty from the beginning. His limbs were surpassing, his nature was superior..."
He let loose the Evil Wind, the rear guard, in her face. She let the Evil Wind in so that she could not close her lips. Her inwards were distended and she opened her mouth wide. 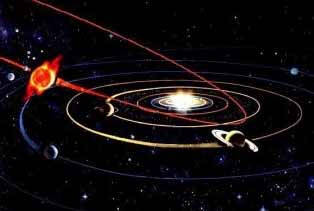 Is this how the arrival of Nibiru into our Solar System could be like? After that, Marduk swoops by Tiamat again, and again crossing her for the second time; Marduk hits Tiamat with his own body, causing her to split in two parts, one of which will become the asteroids belt (which currently orbits between Mars and Jupiter), while the other part will form the Earth, that will be pushed off course by Marduk's satellite “Northern Wind” (in a third collision), and into a new orbit along with Kingu (the Moon), which was originally one of the ten satellites of Tiamat. With his unsparing mace he crushed her skull. He pulled down the bar and posted guards. He ordered them not to allow her waters to escape..."
During his revolution, Marduk attracted the satellite of Anshar (Saturn), Gaga (Pluto), moving it into an independent orbit around Apsu (the Sun) like a real planet. The Euma Elish clearly states that Marduk came from the deep space, somewhere outside our Solar System. The Sumerians called this invader Nibiru, "The Planet which crosses." The Mesopotamian texts, to indicate Marduk's orbit, describe it as an extremely wide path which extended far to unknown regions of the Universe. Still, in the ancient world, there was the belief that every 3,600 years this planet would come close to Earth; in modern times, thorough studies upon this matter seem to give scientific corroboration to these epic tales. Another Mesopotamian text, translated by Viroellaud, contains the description of the members of Mulmul, or our Solar System. This test mentions "twelve planets". Which means "In total twelve members to which belong the Sun and the Moon, and whereupon the planets "
Considering our actual Planetary System, which is formed by nine planets plus the Sun and the Moon, one planet is missing. Nibiru. It is he who without tiring. The midst of Tiamat keeps crossing. at his appearance: Dark red. as it stands in Nibiru." Pluto was discovered in 1930 and this helped initially to explain the interference that were reported over Neptune and Uranus' paths. This theory, however, soon resulted into a quite degree of inconsistencies, for in 1978 W.Christie (Washington's Naval Observatory) proved that Pluto was too small to exert such a strong gravitational influence on the other two planets; a new hypothesis was produced, that of the existence of an unknown planet beyond Pluto, a planet with such a big mass to be capable to modify the orbit of Uranus, to move Pluto and to force Triton (one of Neptun's satellite) into a retrograde path. After Christie's discover, R.S.Harrington and T.C.Van Flaandern (from the same Naval Observatory) held a series of computer simulations and calculated that those orbital anomalies could be caused by a planet double-sized the Earth and about 2.4 billions of Km far from Pluto. The space missions of Pioneer 10 and 11 and of Voyager strengthened that thesis. In 1983 the IRA Space Telescope (Infrared Astronomic Station), after a year of activity, recorded data supporting the "Planet X" theory; the telescope was equipped with a technology capable of capturing celestial bodies' infrared radiations, even of those extremely far from Earth (and thus invisible from land-devices). IRAS sent to the NASA more than 600.000 images which gave an important contribute to the discovering of newborn stars and planetary systems. 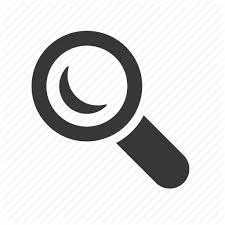 By December of the same year the u.s. press claimed that IRAS had discovered, within the constellation of Orion, a celestial body whose alleged dimension were similar to Jupiter's [Ref. Washington Post's scientific archive]. IRAS Chairman, G.Neugebauer stated that no astronomer had been able to classify that body. Further data established the distance with the Sun in 80 billions of Km, that's close enough to be considered part of our Solar System; the body seemed to proceed Earthward but it was too big and too slow to be a comet. In 1987, during a conference held to the Ames Research Center (CA), the NASA officially announced the probable existence of "Planet X" through its spokesman John Anderson. At the end of the 90's John Murray (UK's Open University) and John Matese (University of Southwestern Louisiana) came separately at the same conclusions: an unknown object existed on the edge of our Space, and it exerts a gravitational pull capable of "slowing the outgoing of probes from our Solar System and detour comets' path". On February, 2000 a big comet was discovered orbiting the Sun along an extremely wide path. The comet has been named 2000CR105 and seems to have a diameter of 400 Km circa. Cote d'Azur Observatory's Brett Gladman and his team have estimated its Perihelium to 6,6 billions of Km, and its Aphelion to 58 billions of Km circa. Among the hypothesis examined, there is one which claims the existence of a planet as big as Mars, orbiting the Sun to an average distance of 11 billions of Km. Nonetheless this planet has not yet been identified. In 2001 Neuchatel's Helvetic Observatory announced that its astronomers had detected a "reddish mass" in the outer space, presumably the same body observed by Lowel's Gordon Macmilla Southam Observatory (AZ). In both cases data confirmed the body proceeding earthward on a regular path. On January, 2002 some scientists declared to have photographed a celestial body approaching Earth on Right Ascension (4h 27m 22s; 12h 8m 20s Declination). "...That doesn't mean I don't believe in the Nibiru existence. I rather believe the Sumerian had an exact knowledge of how our Solar System was like...their information are confirmed by the modern Astrophysicists...through mathematical calculation of comets' path..."
Beyond the scientific data and the ancient legends, it would be worth wondering what if...Nibiru does exist? What does this planet would carry with it? What would the consequences of its arrival be?